In the mid to late sixties, there were a number of other places around the Stateline Area where high school age kids could go to hear their favorite bands. The E.J. Dalton Youth Center in Rockton and the South Beloit American Legion Hall come to mind. A friend told me about a place in Belvidere called the Rumpus Room. There were also “Record Bandstand” dances at the Rock County and Walworth County fairgrounds and, one of my all-time favorites, The Meadow (formerly Ace Hi Roller Rink) in Janesville. 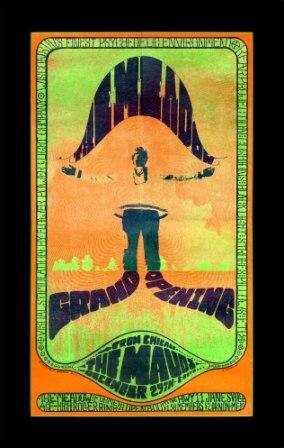 The grand opening of The Meadow (”Wisconsin’s finest psychedelic environment”) was on December 29, 1967 and featured The Mauds from Chicago. Great light shows were provided by Flower Power & Light Company. The Robbs, the Cryan’ Shames (see next blog item), the Heard, and the Beau Gentry played there as well. If anyone has more information about any of those venues and the bands that performed at them, please let me know. Peace.